I am proud to announce this new article written by realpooltalk's first "guest writer". 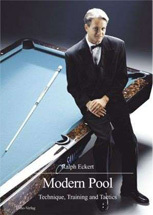 First I knew him as one of Europe's finest players, then as the pool instructor that changed so many people's game with "Modern Pool" and the PAT-system. And now Ralph Eckert came together with realpooltalk to release this article. At this point I'd like to thank Mr. Eckert for his interest and support for this blog but also for the pool world. Enjoy it! Tremendous changes in table size specifications were made in 1949! How about going back to those roots? Hasn’t it just been announced in the January 2008 edition of the Billiards Digest that 9-Ball had died? Soft-breaks, rack machines, break zones, tapping and alternate break, all being cited as reasons for declaring the fall of this discipline, are only causes to some extent. Now I would just like to iterate once more what already has been published in detail. Tournament hosts wanted the hard breaks, but due to new triangles or the tapping of the tables, the hard breaks were not necessary any more. Of course, the players immediately switched to soft breaks. No need to say that the professional players, training on a good (hard) break over years, complained about losing this advantage they had worked on for such a long time! Then the first reactions were rule-modifications to enforce the hard break. So the break box was established (mostly in the USA), the triangle was moved up a bit above the spot (WC 2001 and Euro Tour 2008) and the rule of how many balls must cross the headline after the break (Euro Tour 2007) was modified. Not to mention the decrease of the actual intended pocket size, that organizers initiated (WC 2005)! As a result of that, the WPA specifications were re-mediated afterwards. All these changes ought to make the break (like above) along with the game (tight pockets) more challenging. More challenges, also to avoid the shoot-out of whole matches, were significant for the increase of the playing abilities. It probably would have looked too easy in handling and too boring in TV, just watching one player at the table, leaving no chance for the opponent to show his competence. Accordingly, the change of break had been put to test. Not the winner of a game was able to make the next break, but the player who's turn it was – either after each or after three games. In any case this is actually not my subject here. The point is, that after all these years of modifying and messing around with the rules of the game obviously no satisfying results have been achieved. We will have to look forward to even more changes and additional rules in the future. 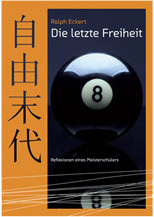 A new discipline called 10-ball has already become common enough to arrange a world championship of its own. Why not? So we’re not just talking about 9-ball here. Finally, the world championship in the almost forgotten classical straight pool is back. It had gone lost, because the play-off to 150 balls was no more a goal that was unable to reach in one inning. Already in 1966 Irving Crane needed only one take (150) to win the US-Open final match against his opponent Joe Balsis. Before the second world-war, a goal of playing up to 300, mostly even 600 balls and more was standard! Is it advisable to play up to 150 balls at a world championship, when almost every attendee has already made a run of over 200 balls and more? No wonder that players turned to more “complicated” disciplines like 9-ball and one-pocket in the 70’s and 80’s. 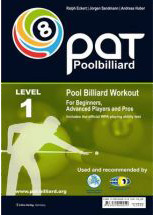 The outcome of this is the question, if pool billiard in general has become too “simple”? Probably not, but it was made “easier” in 1949. Until then the standard pool table had a size of 10 ft! The change to a size of 9 ft was an action to make pool (at that time stagnated) more common again. Now, 60 years later, this goal has been reached: Pool billiard has become international and more popular than ever. As we all know – the more common a sport gets, the higher the level rises. And exactly this is happening at the moment in pool. And it’s going to rise on, although we are already moving at the top level worldwide, very close to perfection. In some countries temporary perfection is meanwhile reached by quite unknown players. Let’s go through it: At first, the WPA should readmit 10 ft tables – also for tournaments! Imagine the next world championship host ordering 10 ft tables: Setting up or aligning the rack in the known position (not above), no break box or any other rule to make 9-ball “more complicated”. Play the game on a “normal” table like before 1949 and you will see: the game is tough enough! Straight pool would also be more interesting. Would you believe that the highest tournament-run before 1947 was 127 balls (held by Jimmy Caras and Willie Mosconi) on the 10 ft table? Secondary effect: Pool wouldn’t look so cute compared to snooker on TV! Every layman can see how “easy” the game is on this much smaller table. That’s exactly how it was, as I first entered the new pool café of Tobias Kim in Ludwigshafen (Germany) in 1982 – I saw this tremendous 12 ft snooker table and thought: “That’s the table the pro’s play on” . Until they gave me the rack with the snooker balls… that was the moment when I realized my mistake. A mistake that wasn’t so capacious, if you compare the income relationship between pool and snooker pros nowadays. Pool billiard on a 10 ft table would not only look more superior – it would be superior! Just think that pool and snooker had been one and the same until 1857 – both were declared as billiard and nor separated by rules or specifications. At that time the standard measurement of a table was 12 ft! This also counts for carom. The game was played with 4 balls – reaching points by pocketing the balls and also by collision of the balls. The US-immigrants wanted to play billiards like in their homeland. At first they brought single tables or imported them. Later they were built by their own billiard manufacturers. So the change of the, anyway not established, specifications began. It was Michael Phelan in 1857, who formed the round pockets (like still used in Snooker nowadays) angular – so the “English” and “American” Billiard were born. At this point, in my opinion, the technical borderline to snooker was set. But that’s an article of its own! About 1871 the first 11 ft table was in use and from 1890 on, the first 10 ft tables had been established until about 1949! It was Jimmy Caras who liked to say that HE would be the last unbeaten champion (1949 against Mosconi) at the 10 ft table. Meanwhile he has unfortunately passed away – but unbeaten! I know the “homicide argument” well, which says that large tables aren’t commercial and that no pool room owner would swap his beloved 9 ft to a 10 ft table. Well – he doesn't have to! But he can! Why are there so many pool halls with 9 ft tables? Why not even 8 ft? Are they also not in the WPA specifications? In the US there are enough! Or maybe 7 ft tables? Oh sorry, we’re drifting to “coin-tables”. What would happen if a pool room would open up with only 10 ft tables? I would do so! It would be quite a paradox – I wouldn’t be able to arrange championships, because the playing materials wouldn’t match the concept of the WPA. Isn’t that delicate? True – it wouldn’t match the requirement – it would be much better! Many officials, players and pool hall owners don’t even know about the existence of 10 ft tables in the past. Not to speak of 11 or 12 ft before 1890! This is reason enough we should not miss to mention these facts and bring them to mind. Especially when the WCBS tries to sell the three games (snooker, carom and pool) as three different disciplines to the IOC. Just think about the fact, that the material in the past was almost unified. Not to emulate snooker – then we could directly start playing pool on 12 ft tables like before 1871. Pool doesn’t need that. After all pool is the most popular billiard discipline! Of course also for the fact that pool is played on smaller tables. That’s the reason 9 ft tables should stay in use – but why additionally make 10 ft tables official? Oh - there was once a very popular top player and world champion, who answered to this discussion that the game itself would change – the whole entire character of the game. Would it be possible to play 8-ball and 9-ball like we do right now? Well, the same complaint could have been given by Willie Mosconi in 1949, for they had changed and simplified “his” game!